Different jewelers will have a different selection. When a couple begins to search for that perfect engagement ring, they have many types of jewelers to choose from. Not every jeweler, however, can provide the best service, selection, and price for every couple, and the best course of action is to shop around and compare different jewelers to find the best personal match before making such a significant purchase. There are several different varieties of jeweleres to choose from when shopping for an engagement ring. Which one will make the best retailer for a specific couple depends on many factors, and before selecting a jeweler, couples should first investigate how each type of jeweler differs. Chain store jewelers such as Kay Jewelers and Bailey Banks and Biddle can be found in malls and shopping centers throughout the country and even around the world. These retailers can always be counted on for consistent service and a similar product line in each location, which may be the perfect choice for couples who prefer to work with the same retailer but may be relocating to different areas throughout their marriage. Because these jewelers can buy in bulk and distribute items to many stores at once, they are able to offer low prices and frequent discounts. At the same time, however, their customization options are low and the selection may not include rare pieces such as Asscher cuts, multi-tone rings or pave settings. Online jewelers can reach a large consumer market without geographical constraits. This will allow a couple to choose whichever ring design they wish without worrying whether a local retailer can provide it. Online merchants may also have a larger available selection of rings, and because they do not typically maintain many physical stores, their overhead expenses are low, which helps keep the engagement rings affordable. Blue Nile Diamonds and Robbins Brothers are both superior online retailers for a variety of engagement rings and diamond jewelry. Independent merchants may be harder to find, but they frequently offer a much more unique selection of rings in addition to classic, timeless designs. The downside is that the rings may be more expensive, though the high level of personalized service and customization may make up for a higher price tag. Small retailers stay in business through their excellent reputations, however, and couples who frequent these established merchants will find superior service and an excellent commitment to customer quality and satisfaction. Designer jewelers fashion exclusive and often highly expensive designer rings, often from hard to acquire, rare stones such as colored diamonds or large carat weights. Their inimitable designs are unique and contemporary, though some designers do work to incorporate expected traditional elements into their work. Many designers have boutiques only in fashion-conscious cities such as New York, Los Angeles, or Las Vegas, though other retailers may be licensed to carry designer merchandise, or it may be available online. Cartier, Tiffany, and Tacori are some of the most sought after engagement ring designers in the world. Store Layout: Are the rings attractively displayed? 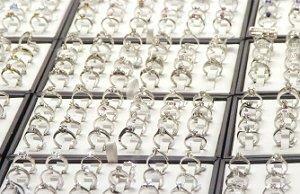 Can you carefully examine individual rings in adequate lighting? Ring Selection: Are different metals available if requested? What about gemstone rings or alternative engagement rings? Customization Options: Can the ring be engraved if desired? What other style alterations can be made? Certification: Do the diamonds come certified if appropriate? What precautions are in place to avoid conflict or blood diamonds? 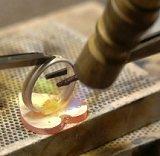 An engagement ring is a significant purchase, a couple should never feel pressured to work with a particular jeweler. If discounts and deals are offered that seem too good to be true, careful investigation is necessary to be sure the stones are not imitations or otherwise of lower quality than described. The salesperson should be able to answer any questions about the ring as well as the store's policies, and the couple should feel comfortable with the prices and other factors involved in purchasing the ring. Buying an engagement ring is one of the most nerve-wracking purchases a couple may ever make, and it is important to choose the best jeweler to match the preferences and demeanor of the couple. Just as the marriage will last a lifetime, so will the relationship with the jeweler, and knowing which type of jeweler to choose will help get the engagement off to a sparkling start.